HMB (Beta-hydroxy beta-methylbutyrate) is a metabolite of the amino acid Leucine. This means that it is a natural bi-product of the breakdown of leucine, a constituent of normal dietary protein. Small amounts of HMB are found in certain foods like catfish, alfalfa and it is a natural component of mother’s milk, but generally speaking it’s pretty scarce in the average diet. HMB was first discovered in the 1950’s and has been studied for several decades, but only really became popular as a sporting supplement in the mid 90’s. HMB has been found to slow down the degradation of muscle protein as well as enhance muscle gain, which means that it possesses both anti-catabolic and anabolic qualities. Early research has demonstrated that HMB supplementation lowers harmful blood cholesterol and helps strengthen the immune system too. HMB supplements were first used in the farming industry to help farmers raise leaner cattle and keep them free from infection. Scientists who studied animals taking HMB found that it increased muscle growth, immune function and reduced subcutaneous fat (the fat stored directly under the skin). More recent research with human subjects has shown similar benefits. A highly respected research scientist called Dr Steven Nissen and his research team at Iowa State University conducted a study to determine if HMB would prevent muscle breakdown in humans undergoing resistance training and whether differing levels of protein intake would affect muscle mass or strength. They also assessed the effects of training and HMB administration on body fat and lean body mass levels. The researchers found that HMB supplementation decreased muscle breakdown in the group that took 3grams. Muscle strength also increased by 18.4% in the 3gram group, compared with 8% in the placebo group and muscle mass also increased by 2.66lbs and 0.88lbs respectively. 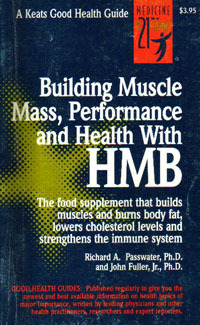 As we have established, HMB is derived from the essential amino acid leucine. Essential amino acids have to be delivered to the body via the diet and usually human HMB production averages around 0.2 to 0.4grams per day, depending on how much leucine is present in the diet. Researchers have experimented with high dietary doses of leucine to see if this results in higher HMB production and although this has worked, for HMB production to reach ‘gram’ quantities, you’ll need 20 to 50grams of leucine per day. Supplementing with these quantities of leucine is incredibly expensive and is likely to upset your stomach. Therefore, supplementing directly with HMB makes for better cashflow and less toilet paper! In order to establish how HMB might work, researchers have formulated hypothyses and tested them. It is known that HMB improves the protein balance by reducing catabolism (breakdown) and increasing anabolism (build-up) of muscle, but it is not fully understood how this occurs. It was first though that HMB might be blocking the enzymes that carry out this catabolic process or that HMB itself may be an integral part of the cell membranes. Whilst neither of these hypotheses has been ruled out, scientists now believe that HMB is most likely to be a precursor to a vital component of cell membranes, cholesterol. Rest assured, HMB has also been found to reduce harmful LDL (low density lipoprotein) blood cholesterol levels too, so HMB supplementation could reduce the risk of heart disease as well. Can we trust the HMB research? 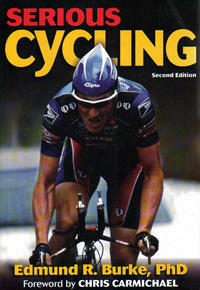 1) One of the most highly respected physiologists in the world, Dr Edmund Burke, consultant to Chris Carmichael (Lance Armstrong’s coach) gives the ‘thumbs up’ to 8 specific supplements in his “Serious Cycling”* book and HMB is one of them (the others being caffeine, ribose, glutamine, glycerol, MCTs, L-carnitine and glucosamine). He recommends 3grams per day for cyclists looking to increase strength and power, similar to the 3-5gram dose he suggests for ribose supplementation. 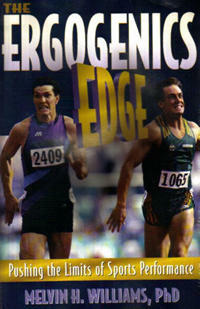 2) Another highly respected author with over 30 years research experience on dietary supplements, Dr Melvin Williams, author of “The Ergogenics Edge”** provides very honest appraisals in his A-Z of sports ergogenics. He covers everything from Alcohol and Amphetamines through to Zinc and there aren’t many supplements he recommends. Of the few he’s reasonably positive about, HMB is one of them. He says “Although the effectiveness of HMB supplementation as an effective sports ergogenic remains to be proven, the preliminary data are somewhat supportive and it appears to be a safe, legal and ethical supplement.” He goes on to say “Endurance athletes who train intensively might benefit if HMB would prevent muscle tissue degradation.” Not a glowing report, but certainly on a par with his conclusions on Creatine supplementation, which is generally acknowledged to work (and without a doubt less beneficial to the endurance athlete). 3) The TORQ riders have been using it. Just like TORQ ribose, which I farmed out to the TORQ riders before it went on sale on this website, many of the TORQ-tuned riders have been using TORQ HMB since the end of September last year. Initial feedback has been very positive, but not quite the resounding seal of approval that TORQ ribose got. It’s early days and I think time will tell with this one – obviously I’ll keep you posted on developments. Well, that’s the whole truth and nothing but the truth from us on HMB supplementation. At TORQ we’ll always give you the facts, so that you can make your own mind up about which supplements (if any) you wish to take. We felt that the strong recommendations supporting HMB’s effectiveness by the two very esteemed research scientists mentioned above was sufficient for us to trial it with the TORQ riders. 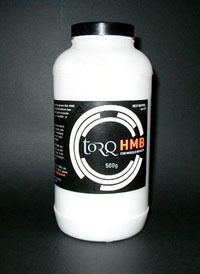 If you want to become part of this non-scientific trial, you can purchase HMB now from the TORQ shop. Be warned, unlike TORQ ribose, which has a lovely sugary taste, TORQ HMB doesn’t taste too pretty, but hey – in capsule form, 500g of HMB would cost you about four times as much. Click here to enter the TORQ shop. *Burke, E.R. PhD (2002). Serious Cycling. Human Kinetics. **Williams, M.H. PhD (1998). The Ergogenics Edge. Human Kinetics.